As a member of the Tsar's Guard, I thought it was imperative to give you all an idea of what being Russian means. We are a very proud people with very distinct (and possibly strange) cultural traits. Here are Ten Things You Need to Know about Russians! 1. Russians are very nostalgic. "When I was young" and "back in the day" are pretty common phrases. Russians loooooove reminiscing about times past. This is especially true for Russian grandparents, who will only listen to older music, watch old movies, and constantly talk about how much better everything was during their youth. "Oh Yuriy, back when I was young, it was so wonderful. Before people were spoiled by indoor plumbing and cars, we had to wake up at sunrise to carry buckets of water from the frozen river and then ride Misha the Donkey to town. Ah yes, those were the days..."
Additionally, Russians LOVE giving emotional and nostalgic toasts. During a party, any excuse for another shot will be coupled with a new toast. These can range from short and sweet ones to extremely long-winded, rambley ones. Regardless, be prepared to follow up each toast with a shot, or at least a couple sips of your (most likely alcoholic) drink. "Mashinka darling, I wish all the best for you in your life, happiness, success in career.. hopefully as a doctor, and then in medical school, for you to meet nice boy.. nice Russian boy, of course. And then I wish for you to finally marry, as you are already almost 19. Back in my day, girls were already married and had three children by then. I married your dedushka when I was 16, and.. what was I saying? Oh, yes, yes. I wish you happiness, success in career, a nice Russian boy..."
Parties will always be a huge affair, going to take out the garbage will always involve dressing up nicely, and any excuse to throw on an expensive fur coat and tons of jewelry will be taken advantage of! At Russian parties, there will always be black caviar served at the table. This caviar costs over $100 for a tiny 3.5 oz jar! And guess who ends up eating it when the party is over and the caviar is untouched? Yep.. the cat. 3. Russians are social singers. ...all within the span of one party! 4. Russians really do love their vodka. This may not be a huge shock to anyone, but Russians are pretty passionate about their vodka. 5. Russian kitchens all have staple items. Russians will always have at least some of the following items in their kitchen: black bread, buckwheat (kasha), soup, beets, and definitely something pickled. And I'm not just talking about regular pickles here, because Russians love pickling just about anything, ranging from tomatoes, peppers, cabbage, mushrooms, herring, and even watermelon! 6. Russians love feeding people. As a guest in a Russian home, be prepared to be fed—a lot. It's considered good hospitality to feed (and overfeed) your guests, so Russians will pull out all the stops to stuff you with everything in their fridge, their neighbor's fridge, and the nearby grocery store's food stock. Russians parties involve so much food that it literally never fits on the table and has to be alternated or brought out in huge courses. Russian babushkas are basically pushy hobbits who cry if you don't eat their food. "Pashinka, are you trying to make babushka cry? Do you want babushka to have a heart attack? Look how skinny you are, and you're barely eating. This is your mother's fault. You've only eaten the piroshki, the sandwiches with pickled herring, two bowls of borsht, and some Oliviye salad. I'm still working on the main course, so here, open your mouth, I'll feed you.."
7. Russian teachers are scary as hell. Whether your Russian teacher or tutor is teaching you math or physics or figure skating, be prepared to fear for your life at least once during each lesson on a good day—if you're a great student. Russians are very serious about whatever they're teaching, so don't expect any participation medals. You didn't get 1st place? Failure. But don't worry, they won't actually kill you. They might make you cry though, and they probably won't feel bad about it either. It's meant to help toughen you up. "Is this joke, Dima? Boo hoo, small crack in toe. Poor baby. If Oksana Baiul can skate with back broken, go do Toeless Lutz and cry later. But I make joke, get it? Toeless?" 8. Russians are very superstitious and spiritual people. *It's considered a huge no-no to physically step over a person. If you accidentally do it, you have to walk back and step back over them. If you don't do so, they will never grow (and so this especially applies to stepping over children). *If you whistle indoors, it's considered a bad omen and all of your money will "fly out of the house"
*Never say "Happy Birthday" or celebrate a person's birthday early. This is considered to be bad luck. *Similarly, never buy presents or clothing for a newborn before the baby is actually born. *Flower bouquets MUST contain an odd number of flowers. Even numbered bouquets are reserved only for funerals. *If you sit on a cold surface (like cold marble, for example) then you will damage your reproductive organs and become infertile. If I had a nickel for every time this has been said to me, I'd be filthy rich. 9. Russians love the fine arts. And they're pretty prissy about it, especially with names like Dostoyevsky, Tolstoy, Gogol, Pushkin, and Tchaikovsky to throw around. Russians are very passionate about things like literature, poetry, classical music, and ballet. "Vitalik, what is this 'hip hop' you started listening to in America? This is not music. It make my ears bleed, see? Now Tchaikovsky... that is real music. You see, back in my day..."
10. Russians don't smile at strangers. In many countries, it's considered normal to smile at strangers on the street, or as you peruse the grocery store aisles. In Russia, people will think you're weird or even on drugs if you're walking around smiling and greeting strangers randomly. Russians do not equate smiling with politeness, and they might even think you're laughing at them if you look at them and smile! To a Russian, a smile must be earned by saying a funny joke or by being a person they are happy to see! "Policeman: Why you smile at me? So I look funny to you, huh? Show me your documents. And do tell. How much did you smoke to become this happy?" Despite how strange this whole "no smiling" thing sounds, Russians are actually pretty nice when you get to know them, so don't be (too) scared! Russians are actually very affectionate people with friends and family. 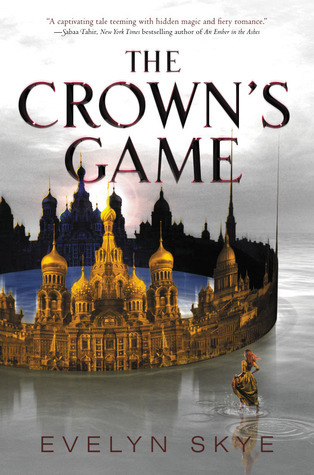 Now that you have all of this knowledge about Russians, you are ready to read The Crown's Game! Evelyn Skye was once offered a job by the C.I.A., she not-so-secretly wishes she was on “So You Think You Can Dance,” and if you challenge her to a pizza-eating contest, she guarantees she will win. When she isn’t writing, Evelyn can be found chasing her daughter on the playground or sitting on the couch, immersed in a good book and eating way too many cookies. THE CROWN’S GAME is her first novel. Find the entire Tsar's Guard Parade Schedule on Evelyn's Website! My entire family is Russian so it sounds like your friend and I would get a long well. Russians love sharing photos haha. I swear, every chance my relatives get they drag out the big photo albums to look at. I have seen Enemy at the Gates but it's been a while. I'm really glad that you liked the post! You definitely need to read The Crown's Game I know you'll love it! Those who come to read your article will find lots of helpful information from this in-depth article which is giving great things about Russians whose aim is to show the personality and behavior of Russians. Since I am providing best & executive CV writing services - https://www.cvfolks.co.uk/executive-cv/ at CV Folks which can definitely help you to get your desire job! Hence, I also loved the portion you have covered in your post about Russians love with fine arts. Thanks for sharing such a great content. My family moved from Russian to the States when I was young and this is all SO TRUE! I couldn't stop laughing while reading this, and my family also loves the Vodka song lol. This is a great list, thank you for teaching me more about Russian culture! This is a fantastic list because you give details under each point. What an awesome cultural lesson before I read this book. Love this so much! Thank you! I'm glad you enjoyed it! I drew from things I know of my family =) I hope you love the book as much as I do! The Girl Who Fell Blog Tour + Giveaway!